George Lucas’s Star Wars franchise seems to get new installments nearly every year. With this spin-off, Solo: A Star Wars Story, we get a “prequel” that delivers the backstory of young Han (Alden Ehrenreich, Beautiful Creatures), his enduring friendship with co-pilot, the giant wookie Chewbacca (Joonas Suotamo, Star Wars: The Force Awakens), and how he finally got his hands on the Millennium Falcon spacecraft. The Kasdans, father Lawrence and son Jonathan, have crafted a thrill-a-minute script that is very much in the Star Wars tradition but with a totally new cast and a new series of life-threatening conditions. Young Han is a common street thief living in Corellia, a dingy planet devoted to building spacecraft. 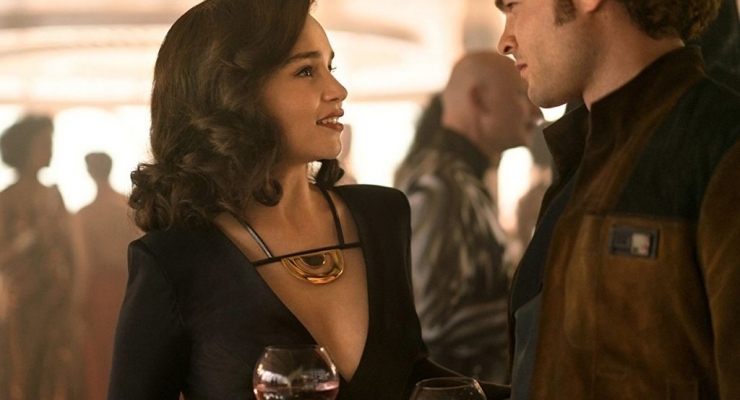 Han and his lover Qi’ra (Emilia Clarke, Game of Thrones) get separated when they try to barter a vial of the hyper fuel coaxium to bolt off-planet en route to finding a better life. Three years later, Han’s dreams of becoming a fighter pilot vanish when he is expelled from flight school. As a regular Army grunt, Solo gets involved in an endless firefight and encounters the wily and crooked Tobias Beckett (Woody Harrelson). Solo ends up in a muddy jail cell where he meets Chewbacca and engineers a successful break out. The odd couple join forces with Beckett to steal a shipment of coaxium but the heist is foiled by the space pirate Cloud-Riders, led by Enfys Nest (Erin Kellyman, Raised by Wolves) and Beckett loses his wife and partner in crime, Val (Thandie Newton, TV’s Westworld). Beckett, Solo and Chewy try to explain their failed mission to brutal crime lord Dryden Vos (Paul Bettany, Captain America: Civil War). Dryden now “owns” Qi’ra who has joined Crimson Dawn run by the satanic-looking Darth Maul (Ray Park, Star Wars I: The Phantom Menace). Vos will give the band of thieves another chance for redemption if they can steal unrefined coaxium from the mines on Kessel and bring it to Savareen to be refined. Qi’ra will accompany them on this dangerous mission that has little likelihood of success. Solo convinces smuggler and sabacc card-cheater Lando Calrissian (Donald Glover, Spider-Man: Homecoming) to join them on his Millennium Falcon and share in the profits. Of course, this would not be a Star Wars film without great ‘droids like Lando’s co-pilot L3-37 (Phoebe Waller-Bridge) who is secretly in love with her boss. Han shows off his navigational skills and utter fearlessness as the group survives both a maelström and a giant space creature. After plenty of plot twists, there is the inevitable seat-of-the-pants conclusion that sets the stage for an almost inevitable sequel. Director Ron Howard (Inferno) is no stranger to sci-fi cinema and his level of comfort with this genre is obvious from the opening credits. Howard’s attention to detail goes hand-in-glove with prolific cinematographer Bradford Young’s (Arrival) capture of a fantastic universe seamlessly mated with its CGI effects. But it is the cast that makes or breaks a Star Wars flick and this one is blessed with young A-list stars. Scene-stealer Donald Glover gives Ehrenreich and company a run for their money but there are really no also-rans here as we get superb villains in Woody Harrelson and Paul Bettany and Chewbacca is, well, Chewbacca. If the purpose of films is to divert and entertain their audiences, then Solo: A Star Wars Story, delivers on all counts. Years before the rebellion, a young Han Solo (Alden Ehrenreich) meets and befriends his faithful co-pilot Chewbacca and comes across fellow rogue Lando Calrissian (Donald Glover) while delving into the seedy criminal underworld. 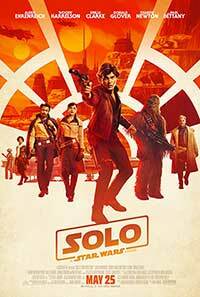 Despite its widely known production woes, Solo: A Star Wars Story is a Star Wars spin-off that delivers Han Solo's backstory and never fails to entertain with a pulse-pounding plot, great 'droids, and a young A-list cast that entertains and diverts.